This map illustrates satellite-detected shelters in the Oncunipar Refugee Camp in Merkez District, Kilis Province, Turkey. 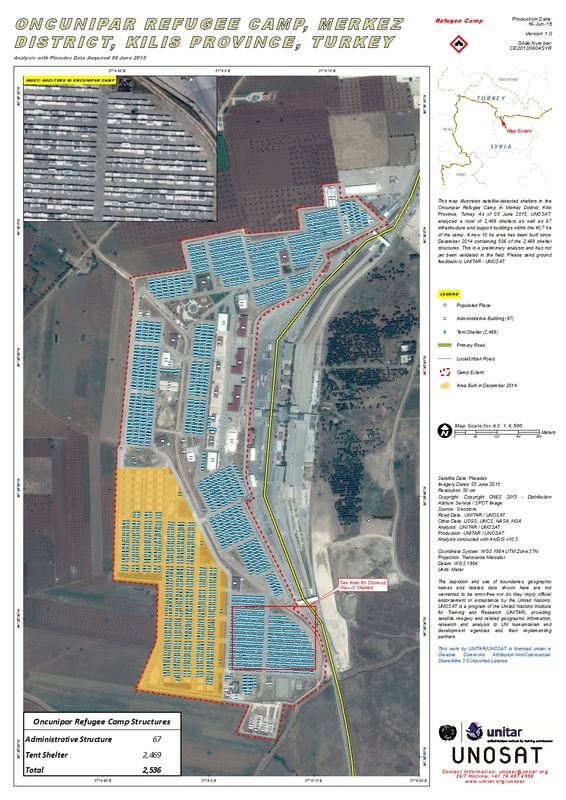 As of 05 June 2015, UNOSAT analyzed a total of 2,469 shelters as well as 67 infrastructure and support buildings within the 40.7 ha of the camp. A new 10 ha area has been built since December 2014 containing 506 of the 2,469 shelter structures. This is a preliminary analysis and has not yet been validated in the field. Please send ground feedback to UNITAR - UNOSAT.